Liars gonna lie. And CNN will have their backs. 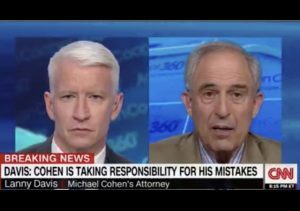 From MSN: Lanny Davis, the high-powered attorney of President Trump’s longtime “fixer”-turned-foe Michael Cohen, admitted Monday he was an anonymous source for a bombshell CNN story on the infamous 2016 Trump Tower meeting — after The Washington Post outed him as a source for its own story. Davis told BuzzFeed News Monday night he regretted being the anonymous source as well as his subsequent denial. The CNN story, which cited multiple “sources,” claimed Cohen said President Trump knew in advance about the Trump Tower sit-down. “I made a mistake,” Davis told BuzzFeed. CNN, which has stood by its reporting, did not immediately respond to Fox News’ request for comment. Davis spent recent days walking back his bombshell assertions that his client could tell Special Counsel Robert Mueller that Trump had prior knowledge of the meeting with a Russian lawyer discussing potentially damaging information on Hillary Clinton. Trump has denied knowledge all along, and fired back following CNN’s report last month. “I did NOT know of the meeting with my son, Don jr. Sounds to me like someone is trying to make up stories in order to get himself out of an unrelated jam (Taxi cabs maybe?). He even retained Bill and Crooked Hillary’s lawyer. Gee, I wonder if they helped him make the choice!” Trump tweeted on July 27. The CNN report from July 27 headlined, “Cohen claims Trump knew in advance of 2016 Trump Tower meeting,” cited “sources with knowledge,” contradicting repeated denials by Trump and his surrogates, as Fox News previously reported. CNN’s report resulted in countless cable news segments and sent other news organizations scurrying to match. Among them was The Washington Post. On Sunday, the newspaper published an interview in which Davis backpedaled. “Davis’s latest comments cast doubt on what Cohen may know, including about a June 2016 meeting in New York’s Trump Tower attended by Trump’s eldest son and a Russian lawyer,” the Post wrote on Sunday night. Davis started walking back the allegations last week, when during an interview with CNN’s Anderson Cooper, he was asked whether there was evidence that Trump knew about the meeting before it happened. “No, there’s not,” Davis said. This entry was posted in 2016 Election, Donald Trump, Donald Trump, fake news, FBI, Liberals/Democrats/Left, Lying Crooked Hillary, Media, MSM, Russia and the 2016 election, Trump Derangement Syndrome, United States, US Presidents and tagged #thisisCNN, Anderson Cooper, BuzzFeed News, CNN, Donald Trump Jr., Lanny Davis, Michael Cohen, Robert Mueller, Trump Tower, Washington Post. Bookmark the permalink. Dictionaries should have a new synonym for “liar” and “unprincipled”: Democrats. So so gratifying to see the Demonrats go down on a sinking ship. The leftests have been/are furthering their exploits by rolling with the punches, going with the flow, cheering anything that supports their rhetoric of ANY miniscule negative tidbit of anti-Conservativism. They are the moldy molecules of dust that change with the slightest breeze in order to further their survival despite, (or perhaps because of), their obscene desire to pollute, infect or otherwise destroy any and all vestibules of Godliness.